A festive holiday box filled with 3 oz. 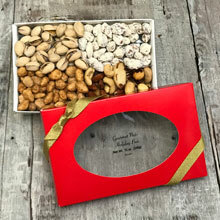 each of Roasted and Salted Pistachios, Roasted and Salted Mixed Nuts, Butter Toffee Peanuts, and Orange Honey Almonds. Packaged in a 12 oz. gift box. Net wt. 12 oz. Ship wt. 2 lb.